The formula is simple when selling your home. You take the cost of the home improvements, subtract that number from the final price and when the dust settles you have your return-on-investment (ROI). The formula is easy, but coming out on the right side of it can seem like a nightmare. You’re faced with dozens of leaps of faith and unanswered questions. Will this new deck really boost my resale value? Do people in this market care about a hot tub? Every home and market is different, but some home improvements are statistically proven to outperform others when trying to fetch you a higher asking price, and a quicker closing time. Based on averages, here is the biggest money pit and the biggest moneymaker. There is a reason we always talk about curb appeal— because it really matters. First impressions are huge in real estate, and when your would-be buyers are seeing 3 and 4 houses in an afternoon, you want to stand out immediately. So concentrating your time and your budget on the home front exterior is always going to give you a high ROI. Let’s start with your garage door. This underappreciated part of your home takes up as much as 30% of your home façade, and a new one can actually show you an ROI of 97.5%. That’s clearly massive. A stylish garage door will instantly boost your curb appeal and help your home stand out when people are browsing pictures and listings online. Garage door retailers like Doddsdoors.com sell modern insulated doors with an amazing R-value. You can brag about their efficiency and energy savings, which could be a deal-breaker for families who will use the garage as a workshop or a home office. Everyone loves to sit on a patio with a cool beverage and some meat on the grill. But are homebuyers willing to pay more for this experience? Not always. Investing heavily in your backyard is a bit of a dice roll. It’s been proven to have a low or unpredictable ROI. You could make 50% of your money back, but you can just as easily take a loss on the investment. If you’re selling in a relatively warm climate, where your homebuyer can get 3 full seasons of enjoyment of the backyard, the investment is more likely to pay off. But, if that backyard is going to sit under a blanket of snow for half the year, it’s not exactly a dealmaker for buyers. It may also not be worth your emotional investment. Backyard renovations are one of the bigger projects you can take on. There is typically landscaping and construction involved, which can lead to complications that push your deadlines forward and eat away at your ROI. While landscaping projects can end up costing a lot, upgrading the cooking appliances for your backyard setup can really help transform the area. For example, the use of backyard smokers in the BBQ setup is much more common (check out this guide to charcoal wood smokers) and many homeowners know they’ll be doing a lot of cooking, so it makes a big difference. One of the best elements here, is that your fancy new appliances comes with your to your new home, while making the backyard your selling seem more appealing! If you’re in a hurry to sell your home because of a lifestyle change like a new job, it’s hard to argue with the fast results you will get with a new garage door, versus a major overhaul of your backyard. 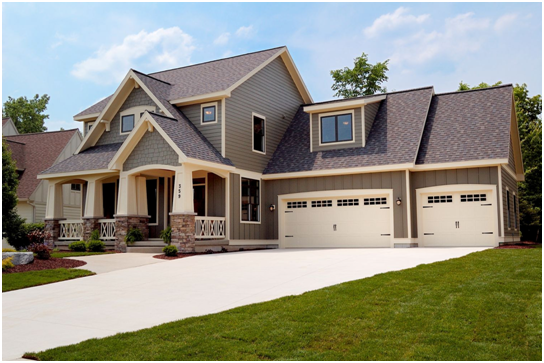 Most people give the front of their homes a facelift by starting with a new garage door, then repainting the exterior with fresh colors to complement the door. The entire process can be done in under 2 weeks, with an ROI of over 90%!